The camera unit at the back of the Karbonn Opium N9 is an 8 MP one which is coupled with LED flash. The presence of LED flash will definitely provide better low light photography that is expected from a sub Rs 10,000 priced smartphone. Also on board is a 2 MP front-facer that assists in video calling and in clicking self portrait shots. The native storage capacity of the handset is 4 GB and this can be expanded with the help of the expansion memory card slot in the device. Only 4 GB of internal storage space is quite standard and for its pricing there should have been at least 8 GB of storage. The device is based on a quad-core processor of unknown chipset that ticks at 1.3 GHz clock speed. This processor is paired with an average 1 GB of RAM that can render good levels of multi-tasking that is required by a smartphone of this pricing. Moreover, most of the competitors of the Opium N9 also come with similar hardware aspects and hence this is not something very different. The battery unit inside the handset is a 2,000 mAh one that is acceptable as it can manage pumping a decent backup to the device with standard specifications. Though a 2,500 mAh battery would have sweetened the deal further, we cannot expect too much from a smartphone of in this price range. 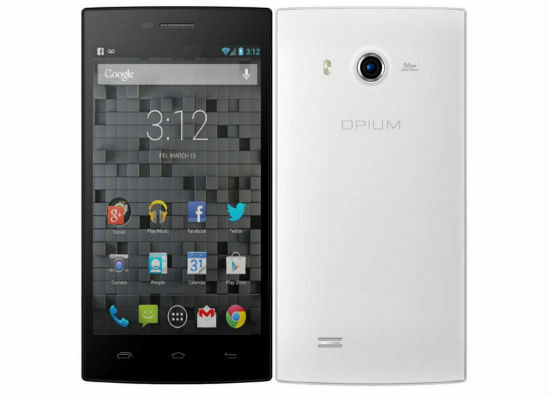 Karbonn has given the Opium N9 a 5 inch IPS display that carries a resolution of 1280×720 pixels. This screen resolution translates to an average pixel density of 293 ppi. While there is a decent pixel count making the display suitable for all sorts of basic tasks such as videos and gaming, the IPS panel renders good color reproduction and contrast along with wide viewing angles. The handset runs on Android 4.3 Jelly Bean OS and features dual SIM functionality along with 3G, Wi-Fi, Bluetooth and GPS for connectivity. From the specifications and pricing, the Karbonn Opium N9 will be a stiff competitor to Micromax Canvas Elanza 2 A121, Xolo Q1011, Spice Stellar Mi-600 and Intex Aqua i15. The Karbonn Opium N9 is a pretty good device for Rs 8,999. There is a good camera, an average display and other hardware aspects. If the vendor incorporated a better battery and at least 8 GB of default storage capacity, it would have become a better offering that could top its rivals.